Your iPhone comes stocked with 25 predefined ringtones. Although some of them are amazingly annoying, you ought to be able to find one you can live with. If you can't, or if you crave something unique, you can create a custom ringtone and use that. In earlier versions of iTunes, the easiest way to cobble together a custom ringtone was to convert a song you purchased through the iTunes Store. Unfortunately, that feature was removed in iTunes 10. You can always purchase ringtones in the iTunes Store, but there are still a couple of techniques you can use to create a custom (and free!) ringtone, as the next couple of sections show. In iTunes, play the track you want to use. While the track is playing, watch the playback time and note the start time and end time of the portion of the track you want to use as your ringtone. Ringtones can be a maximum of 30 seconds long, so select a portion of the track that is no longer than 30 seconds. Choose File → Get Info. The track's Info dialog appears. Use the Start Time and Stop Time text boxes to type the starting and ending points for your ringtone snippet (see Figure below), and then click OK.
With the track still selected, choose Advanced → Create AAC Version. iTunes creates a version of the track that includes only the snippet you specified in Step 4. Click the new version of the track, then choose File → Show in Finder. A new Finder window appears with the short version of the track selected. Press Return to open the filename for editing, change the extension from m4a to m4r, and then press Return. The m4r extension designates the file as a ringtone. OS X asks you to confirm the extension change. Click Use .m4r. OS X converts the file to a ringtone. 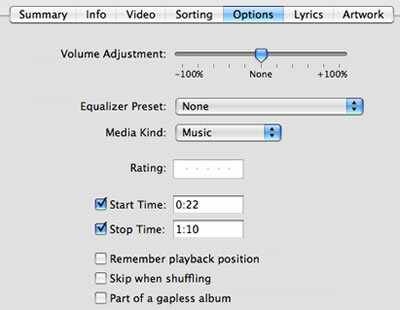 In iTunes, make sure the short version of the track is selected, and then choose Edit → Delete. iTunes asks you to confirm. Click Remove. iTunes asks if you want to move the file to the Trash. Return to the Finder window that contains the ringtone, and then double-click the file. iTunes plays the ringtone, but more importantly, it adds the file to the Tones section of the library. The technique in the previous section is easy, for sure, but it's a bit convoluted. So let's look at a second, more straightforward, method that uses GarageBand, the Apple application for making homebrew music. Click the GarageBand icon in the Dock, click iPhone Ringtone, click Choose, type a name for the project, and then click Create. GarageBand starts a new project for you. Choose Track → Delete Track to get rid of the default track. Switch to iTunes, click the song you want to use for your ringtone, and then choose File → Show in Finder. OS X displays the song's file in a Finder window. Click and drag the file and drop it inside GarageBand. The program creates a new track for the song. Click and drag the Cycle Region to the approximate area of the song you want to use for the ringtone. The Cycle Region, pointed out in Figure below, defines the portion of the song that you would use for a ringtone. If you don't see the Cycle Region tool, click the Cycle Region button pointed out in Figure below. If the song is protected by digital rights management (DRM), you won't be able to import it into GarageBand. Click and drag the left edge of the Cycle Region to define the starting point of the ringtone. 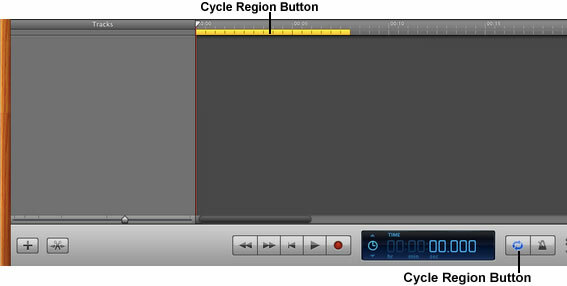 Click and drag the right edge of the Cycle Region to define the ending point of the ringtone. Click Play to play back the ringtone. If your start and end points aren't quite right, repeat Steps 6 to 8 until your ringtone is set. Choose Share → Send Ringtone to iTunes. GarageBand converts the track to a ringtone, and then adds it to the Tones category in iTunes. The maximum length for a GarageBand ringtone is 40 seconds. To see how long the Cycle Region is, choose Control → Show Time in LCD. Click your iPhone in the iTunes Devices list. Select the Sync Tones check box. Select the Selected tones option. Select the check box beside each custom ringtone you want to use on your iPhone. To use the custom ringtone on your iPhone, tap Settings in the Home screen, tap Sounds, and tap Ringtone. Your ringtones appear at the top of the Ringtones list. Tap a custom ringtone to use the snippet as your ringtone. You can also use the Sounds screen to apply a custom ringtone to other sound events, such as incoming text messages, voicemails, and e-mail messages.